The third round of the EuroLeague Women competition ended well for Bourges Basket and USO Mondeville with victories against Rivas Ecópolis and Perfumerías Avenida respectively. Arras were not so lucky after leading by 10 points going into the final quarter, they lost to Good Angels Kosice. UMMC Ekaterinburg made it three EuroLeague wins in a row with another hard fought victory against ZVVZ USK Prague (78-71). UMMC needed a big third-quarter performance by Diana Taurasi who scored 13 of her team's 30 points in this quarter. Taurasi finished the game with 25 points and 5 assists. It was not the start that ZVVZ USK's new coach Natalia Hejkova wanted. But she was pleased with the effort by her players. Also in ELW Group C, Galatasaray once again escaped with a victory. This time they held on to beat CCC Polkowice (50-48) in the FIBA TV match of the week. Amanda Lassiter (in picture) helped herself to 21 points and 4 assists as USO Mondeville beat Spanish rivals Perfumerías Avenida (73-64). Mondeville's injury list may have got longer with Naignouma Coulibaly rolling her ankle during the game. Kadidia Minte's absence has already left the team short of inside players. It was Mondeville's defensive pressure that kept Avenida at bay for most of the match while their 50% shooting was more than enough to maintain the advantage. Egle Sulciute who briefly played for Mondeville last season had 14 points and 6 rebounds in her first visit back. Mondeville are a perfect 2-of-2 in EuroLeague Women play. In Group B, Arras was close to winning their first ever ELW game. However 90 seconds of poor decisions at the end resulted in 6 free throws against them costing them the match and let Good Angels Kosice off the hook. Helena Sverrisdóttir and Alexandria Quigley with 17 and 16 points respectively did most of the offensive damage for the Good Angels. 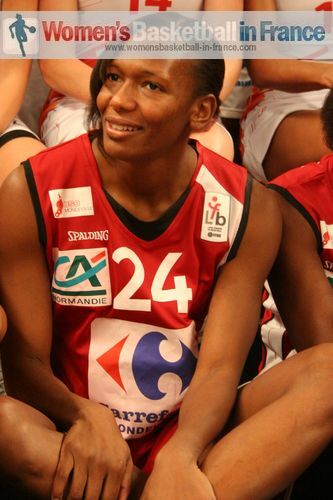 Dawn Evans (in picture) had 15 points and 4 assists for Arras. Yet again playing at home Nadezhda-Orenburg won a cliff hanger (65-64) against Fenerbahce SK. Dewanna Bonner hit the game winning shot with 10 seconds left to play. Famila Schio are a perfect 3-of-3 in group play after seeing off their hosts Uniqa EuroLeasing Sopron in a fascinating but technical final quarter (66-60). For the losing side Jelena Milovanovic and Shenise Johnson (10 rebounds) scored 22 and 21 points respectively. Famila Schio had four players in double digits led by Giorgia Sottana with 14 points and 5 assists. Elodin Godin helped herself to 12 points and 8 rebounds. The other double-digit scorers were Laura Macchi (13 points) and Danielle Mc Cray (12 points). 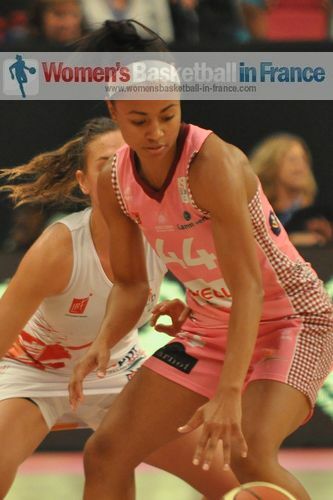 Bourges Basket's fans have been waiting for Céline Dumerc (in picture) to shine like she did in London. Dumerc scored 19 points and dished out 5 assists to help Bourges Basket to beat Rivas Ecópolis (60-49). Bourges were back to their defensive best while controlling the rebounds. Frida Eldebrink was the only other player in double digits for Bourges with 12 points. Oleksandra Kurasova and Vega Gimeno scored 12 and 10 points apiece while Aneika Henry picked 14 rebounds in defeat. Also in EuroLeague Women Group A, BK IMOS Brno won its first ELW match of the season. They beat Wisla Can-Pack (77-74) in overtime. It is not often a player scores 32 points and picks up 14 rebounds and ends up losing. Yet that was the fate for Tina Charles in her first EuroLeague match of the season. Farhiya Abdi (26 points) scored 10 of her team's 13 overtime points and yet it was the three-ball by Veronika Vlková that made the difference. Natalia Vieru led Sparta&K M.R. Vidnoje with 19 points and 6 rebounds to a road victory against Uni Györ(74-56) in the game of the undefeated. Sparta&K are now alone at the top of Group A.